First of all, I want to thank all the people who spread the word about the River City Ransom Shop generator. That helped turn the tide against the last few crappy weeks I’ve had. I was going to wait a bit longer for another update, but I’m putting another small update together just for you. Custom Sprites – the Vanillaware gallery page opens with 8-bit Dragon’s Crown sprites of the six heroes and Morgan. GFX Generators – The RCR Shop Generator turned out to be something people like, so I came back a week early to keep that momentum going. 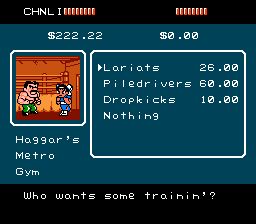 – Screenstyles: River City Ransom NES Shop screenstyle: new BG’s: the Double Dragon Dojo, Gilius’ shop from Shining in the Darkness, Haggar’s Gym and Morgan’s shop from Dragon’s Crown. – Sprite sets: Double Dragon – NES (new with the whole cast), RCR/Kunio-Kun SD NES style edits (separated category with new edits, including Abobo, Wendy Milan (requested by my niece), Gilius Thunderhead), NES – other games (I’m too lazy to list them, so see for yourself), Custom 8-bit sprites (new, with the Dragon’s Crown sprites that don’t fit any other game’s style). 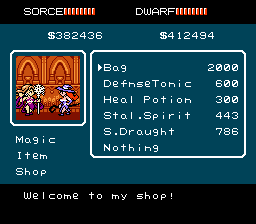 Special note: the “RCR SD NES variable colors” char selection has edited RCR/DNM sprites with the same large palette collection. There are a lot of different combinations of skin and clothing colors. Have fun with it, but beware that the palette selection page might take a while to load. More color combos might be added even after this update post. There’s been a pause in the commission project (though I’m still doing some fixes on the pages), so I’ve put a little update together. Sure, I should be resting, but I’m dumb like that. 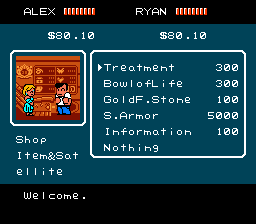 GFX Generators – The River City Ransom Shop screen has been added to the Fake Screenshot generator. 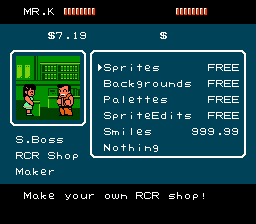 You’ll find sprites of Alex, Ryan, Kunio, Riki and the shopkeepers along with all the shop backgrounds from the game, but you’ll also find a few custom-made RCR sprites and store backgrounds, too. It’s in the same generator set as those Mega Man NES screens, so you can mix and match sprites with those, too. I’ll be adding more shops and shopkeepers in later updates, so some of the obvious picks (like Auto and the bolt shop) will be in later updates. 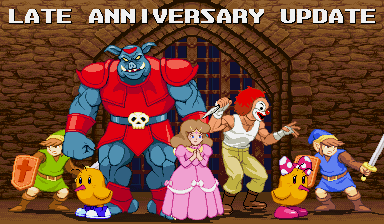 Sprites – Playing Dragon’s Crown reminded me that this site doesn’t have much from Data East’s Dark Seal series of isometric dungeon crawling arcade games, so I just gave it a sprite gallery. I’ll add to it in later updates. I also made a little Tumblr post with Freya, the original heroic, saucy sorceress. Dragon’s Crown hit the PS3 and Vita last week. I pre-ordered the game and got the artbook, one of the few times I’ve pre-ordered a game EVER. It’s an incredibly fun hack-and-slash game with an old-school spirit infused with it’s own unique flavor. Those who are into D&D, Frank Frazetta paintings, 80’s barbarian/amazon movies and classic sword-and-sorcery video games might enjoy this one, especially with all the references to those things being scattered throughout the game. Yes, there’s some saucy artwork in it, so it’s not for the kids, faint of heart, etc. Personally, this is my kind of game, I’m glad that I bought it, and I hope it sells enough copies to get a sequel. Duck Tales Remastered, produced by WayForward, is out now, but I don’t have it just yet. The remake of Capcom’s NES classic looks like another labor of love from the WayForward crew, even more than their usual level of awesome. It’s available on PSN, Steam, and X-Box Live. Due to an irritating and unexpected move to another apartment, the Anniversary update is both late and incomplete. Still, there’s enough here for an update, so let’s do this. Sprites – NARC gallery added. Updated galleries include Double Dragon (a few Double Dragon 2 arcade sprites added). Again, sorry for not being able to deliver on a big anniversary update, but the commission book work’s gotta come first. Future updates will be small and rare until some time in October (hopefully) when I’ll try to cobble a Halloween update together and probably botch that, too. Be prepared for more disappointment!